Three months without a Universal Credit payment. Astounding DWP bureaucracy setting people up to fail. Universal Credit isn’t working. Dear readers, I must apologise. I have a virus and I haven’t been well all week so I apologise in my slow response to responding to you, hopefully I will be feeling much better soon. Today we were met by lots of people with many differing problems, mostly caused by the inane and ridiculous bureaucracy system that the DWP operates. Not one department within the DWP communicates effectively with each other (if at all) and it causes endless hurdles that people have to jump through to receive the help that they need and deserve. Personally I believe that it’s a total reflection of the state of the government at present and their disdain for the poor and disabled. They have created a system that is designed to be purposely difficult to navigate. They just don’t want to help them, but are very quick to help themselves. I’ll list the conversations that I had with people today, it makes things much less complicated. All the people that I spoke to will remain anonymous due to the very real fear of repercussions from the DWP. This does happen, I’ve seen it. We were very busy today, so please read to the end if you can. Everyone that we spoke to were given advice, help, a survival guide and a food parcel if needed. We handed out five today. There is a massive need for help but organisations such as Citizens Advice and Welfare Rights are extremely busy and to put it bluntly have no money. It’s shocking. The first person that I spoke to was a young man who was visibly distressed. He told me that he had applied to claim for Universal Credit three months ago, but due to seemingly constant problems he has been waiting for three months for his first payment. That’s three months without a payment, three months without a rent payment and he is now at risk of being evicted. You see, lots of people don’t understand that whilst awaiting for a Universal Credit claim to be processed you cannot claim Housing Benefit because it is paid as a part of Universal Credit. Personally I believe this to be wrong, it should be paid as soon as a claim is made and approved just like it used to be, and it should be paid directly to the landlord. It doesn’t make sense to do it any other way, unless of course the main aim of the people that designed this system was to increase homelessness, increase poverty and to ensure that people become ill. In their fluffy, perfect worlds they have families that might help. Most of the people that myself and others talk to don’t. And we don’t live in an ideal world either do we. I spoke to an older man that has had his ESA (Employment Support Allowance) stopped due to a failed medical assessment. The assessors appear to be on a roll at the moment, nearly everyone that I speak to that has had a medical assessment either for ESA or PIP (Personal Independence Payment) has failed and they are having to go through the appeal process. This causes a great deal of stress to anyone having to endure this. For gods sake, if they have been diagnosed as being disabled by consultants and doctors then they have already been assessed. This whole process has been purely created to prevent vulnerable people from receiving the help that they need. I had a long discussion with another older man whom has been awarded a lower level of PIP than he previously received after a medical assessment. He is appealing but he was obviously distressed and needed to talk. Like I said previously this is happening far too often. I spoke to a man that I have spoken to previously. He had lost his job and was awaiting his first Universal Credit payment, however the DWP saw fit to not pay him his payment and instead they deducted the money that he should have received as holiday. Instead of being treated as capital, they treated it as a wage so now he has been left with no money and not able to pay his rent. Maybe this is correct, but it’s wrong. They had been informed about the payment of holiday pay and he was informed that he would receive a payment today. Upon waking this morning he tried phoning the Universal Credit hotline up, but he was constantly cut off so he mistakenly believed that the Jobcentre staff would help him. 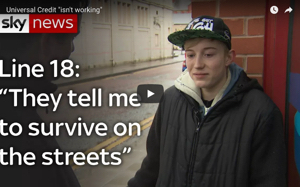 He has no money, his landlord had already telephoned him asking for his rent and the Jobcentre told him that they wouldn’t help and that he had to phone them. He had already tried, he was cut off and he wanted some help. But no, that’s not available anymore. Can you imagine the frustration that he must have felt. Not helping someone in their hour of need is certainly not empowering them to find work, it’s actually preventing a person from concentrating on anything else that day apart from survival. We spoke to two Poundworld employees soon to loose their jobs. They had no idea of what to do, what to claim and how to do it. Neither of them are computer literate either. I helped them the best that I could and explained what needed to be done. My heart sank thinking about the hurdles that they will now have to go through. These are the same ladies that I used to chat to when shopping there. They always had a smile for me and enjoyed their job. I’m not going into the complexities of why Poundworld is shutting, but what I do know is that thousands of people are now being forced to battle a system that doesn’t want to help them and that’s scary. I spoke to a lovely lady who was very aware of how the DWP system works, shes researched herself and has now found employment after gaining a qualification. She told me how hard it is to survive and she lives on her own. She went on to say she can’t imagine how hard it is for a single parent with children, or a couple to survive. We had a very interesting discussion about how women with children resort to crimes such as shoplifting to survive (I’ve mentioned this in an earlier blog). Most eventually end up in court and it escalates to such an extent that they can loose everything. Their home, children, hopes and dreams. These are decent people trying to survive, trying to provide for their children. Even if a parent doesn’t resort to crime it leaves them with the inability to pay for the basics such as food, clothing and bus fares to school if needed. Fines are issued to the parents of children that have over an amount of unauthorised amount of days off school. They can’t afford to pay the fine and are at risk of being imprisoned. It makes me feel sick that this is even happening but it is. Survival is the name of the game for many. Children are suffering, but this government cares not one bit about this. Privately run care homes for children are opening and they in turn charge local councils a small fortune for their services. I worked in one in the past and the owner was doing extremely well out of it. This does need to be investigated more. I spoke to a man that I have spoken to previously. He had left his partner, stopped his claim for carers allowance and had made a new claim for Universal Credit. The DWP were aware that he had stopped his claim for Carers Allowance, but due to a mistake made by them had wrongly deducted the Carers Allowance element from his payment. This has left him with very little money, he needs to pay his rent and he was worried. He phoned the Universal Credit hotline up and has been told that they are investigating and he should receive his money back. Imagine this though, imagine that instead of enquiring as to what had happened he went into a state of panic, couldn’t handle complaining and tried to hide from the problem? Thousands of people do, they are tired and are sick of fighting. Many give up altogether and quite frankly mistakes like this shouldn’t be happening but they are. Universal Credit isn’t working, its not really designed to, and I’m sick of having to say this. It needs stopping, scrapping and replaced with a fair, uncomplicated system. It’s not rocket science is it. I spoke to a man that had previously thought that he was having a bit of good luck for a change. He found a job but his celebrations were short lived. He told me that the working conditions were ‘prehistoric’. He had been forced to work in a very dangerous environment with no health and safety rules being enforced. It was extremely hard manual labour, and dangerous at that. He stuck it out for a week but was afraid for his physical safety so he left. He’s now unemployed again, but told me that he’s thankful to be alive. Employment laws really shouldn’t be flouted, but they often are. Labour is often underpaid and not respected. With high levels of unemployment unscrupulous employers can just employ more and more people to replace the employees that have left. It’s wrong, but it happens and one day a serious workplace accident will take place. We spoke to a man trying to dispute his claimant commitment. The DWP are trying to force him into taking an unreasonable Claimant Commitment. They don’t want to take into account his disabilities. He is pursuing this though and our survival guide will help him with this. The whole DWP system is rotten to the core. There’s no care involved anymore, and everyone is just an expendable number, even DWP employees. It’s a culture of fear and created to be thus. Can you imagine how awful it is for thousands and thousands of people up and down the country on a daily basis? 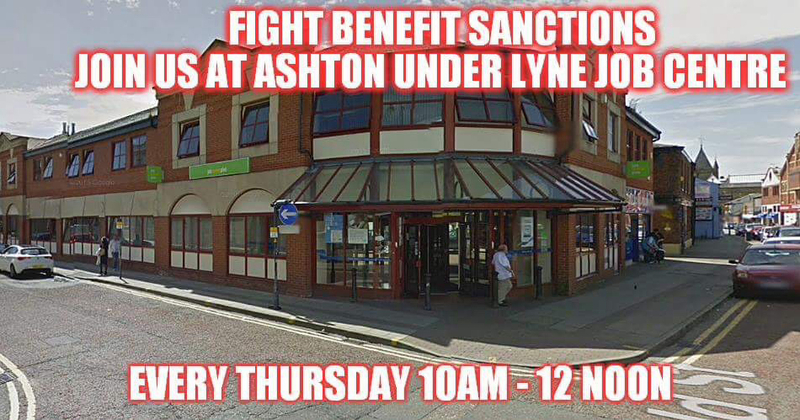 We are only outside Ashton Under Lyne Jobcentre for two hours and in those two hours we encountered this high amount of problems, mostly caused by an overcomplicated system that doesn’t communicate with different departments that is failing the very people that it claims to help. It’s sickening. Please read, share, tweet and fb my blog, email it also. I do my best and it’s hard work but one day we will have justice. No one deserves to be treated like this, no one. They don’t want us to survive. Eviction proceedings. Universal Credit cruelty never ends. Sanctioned for a year for having a voluntary job. Working 25 hours and facing a possible sanction. Universal Credit strikes again. The above makes me so sad. I can only confirm what you say about hardship and theft. I’m a retired Probation Officer and saw this many times over the years. Now that most of the Probation Service has been privatised the service there is apparently terrible too, with Probation Officers stressed out and overworked and so not able to provide a proper service at many offices. Conservative Governments have so much to answer for. I will never forgive them. Robin Hood, Sheriff of Nottingham, and King John in the 21st century. What to do, convert to Islam, relocate in a no-go zone, and be rewarded? Pray to God in the name of Jesus often and elect good people. There are no no-go zones, and Muslims aren’t given any more benefit than anyone else. Absolutely correct there aren’t and they don’t. I don’t tolerate any racism on my blog. Disgraceful isn’t it? I have MS and various other health problems too. I used to get my income support, mid rate mobility allowance and Severe Disablement Allowance. When they forced me to go onto their ESA, they stopped paying my SDA. When I called to query this I was told they didn’t know what I was talking about and they denied the benefit had even existed. (I know this is NOT true as my friends brother who is disabled was put on ESA and his SDA was continued to be paid. I was refused the mobility part of PIP as I was able to make a short walk, with my stick, down my hallway to let the bloke in!!! I have been told I should have appealed against the removal of my SDA and my PIP mobility payment loss. I had no idea I could do the first one – can someone give me a straight answer as to if I can appeal now still? And the PIP appeal – don’t you have to have a solicitor? And haven’t they now stopped legal aid for PIP appeals? I too am facing eviction in 4 weeks time. (LANDLORD IS SELLING). I can no longer afford to go to the dentist (my mouth is in a dreadful state and am frequently suffering with abcesses.) It”s not the dentist fees – it’s the cost of taxi fares for the frequent visits I will have to make, plus a general to remove deep broken roots. I used to be able to pay before as I had enough money, but they’ve taken everything. Also now I have had my free hospital transport taken away, together with my blue badge. All this is such a nightmare. Need advice desperately that is impartial. Don’t know where to go for help. Due to muscle weekness and pain, I am unable to propel myself in my wheelchair so someone has to take time off work to help me. I was recently in the council offices re my impending homelessness nearly all afternoon. By the time they had finished, I was in agony and they still weren’t satisfied. As I have never been abroad and am not allowed to drive anymore, I do not have the required ID. Now I have to go through the rigmarole of getting a Citizen Card. Eg – £15 for card, £30 to get my GP to sign the photocopies of my photo (which I will have to get someone to take me to somewhere I can get the pic printed from my phone and to get loads if photocopies done. More bloody expense I do not have the money to pay for.). Hell on earth. If you’re on income-based ESA, you shouldn’t have to pay for medically necessary dentistry (anaesthesia may not be deemed “necessary”). In my area we have taxi cards, which reduce the cost of taxis by 20%. Ask at your city/county council offices? I’ve heard that people who should be receiving SDP can just call up the DWP to get it, but I’m sure you have to get the right (i.e. informed) person to talk to. Manager, perhaps? PIP appeals don’t require a lawyer, although some people do better with a knowledgeable representative. Sometimes the CAB or Welfare Rights (or other groups in your area) can provide someone,but sometimes not. I’d look online for guides on how to appeal. Benefitsandwork has amazing guides, but they cost £20 per year to join (very worthwhile). The Scope forums are also really useful. Sadly taxi cards don’t exist in most areas. I wish that they did though! Labour should be campaigning to scrap Universal Credit altogether. The DWP have been trying to hide the true reality of it for years. It’s all about forcing people off benefits one way or another, by being as strict with claimants as possible. Agree with you. The working poor are in a mess too. I’ve been left with no money since 5th of March I’m in thousands of pounds in debt rent council tax I have a daughter with disabilities as well as being ill myself with mental health problems physical health problems had sick notes to cover me yet I can’t have a penny got to go back to doctor for a letter to say I have got worse bare in mind I have struggled with an eating disorder for 16 yrs haven’t had any money is it really that hard to work out if I have deteriorated? ??? Confused… where do I go what do I do the government is killing me. I see drug addicts alcoholics obesity on high dla/pip druggies and alcoholics get treatment but still use they go to prison yet are rewarded with dla or pip angers me.